Arps Dairy was founded in 1936 by George Arps (then called Arps Jersey Farm). When the company began, it was located about 8 ½ miles northeast of Defiance, Ohio and its purpose was to sell milk to local families via horse and buggy. Shortly thereafter, in 1938, Arps Jersey Farm acquired a competing milk operation, and that in combination with restrictions imposed by wartime gas rationing were deciding factors to move the dairy to 127 Broadway St, also in Defiance, Ohio. As the business grew and additional space was needed, the present building on N. Clinton Street was erected in 1948. In 1957, a sizable addition was completed which allowed for modernization and expansion of the business. In 1968 the first 5,000 gallon capacity silo was erected. A second 10,000 gallon silo and third 15,000 gallon silo was added in 1971 and 1986 respectfully. In 1982 Arps Dairy completed a large warehouse addition to the rear of the building, and ten years later began the largest project in the company’s history. In 1992 the facility went through a complete modernization by adding 1,400 feet to the processing area along with the addition of high speed filling equipment for school milk and three new storage tanks with a capacity of 19,600 gallons of finished product. In 1996 a high speed plastic bottle filler was added that had a capacity of 75 gallons and 120 half gallons per minute. In 2003 Arps Dairy replaced the finish product tanks with three 6,000 gallon silos and increased the finish product capacity from 19,600 gallons to 33,000 gallons, and also added a 6,000 gallon silo for cream storage. And most recently, in 2017 and 2018, Arps Dairy added two new silos (a 20,000 gallon raw milk silo and a 7,000 gallon cream silo) and embarked on several projects repairing sections of the parking lot and sidewalks. Throughout the years, additions and technological advances were made that results in the current operations we have today. 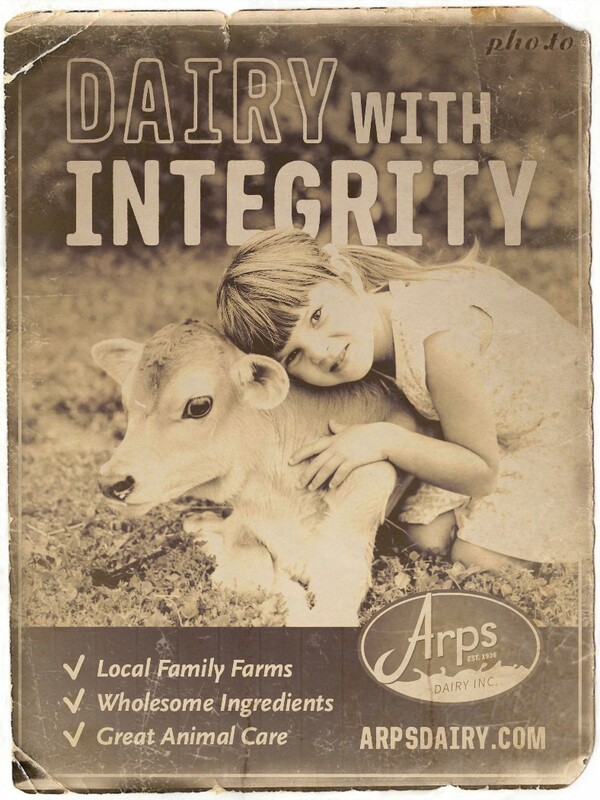 Today, Arps Dairy’s mission is to build strong relationships by bringing quality dairy products from our farms to our community. We do this by staying true to the old-fashioned, small town values established back in 1936 and by sourcing all of our milk locally from farmers we know and trust, supporting our communities and creating meaningful relationships with those around us. We exist to create experiences where service, quality and sustainability all come together. Arps Dairy owes it’s current success to a combination of past and current owners and company leaders, employees and our growing customer base. Over the years, the Arps Dairy leadership team has included George Arps and his three sons, Hank Wiseman, Stephen Boomer and now the current Arps Dairy owners and leadership. In 2015, five local community members who had a passion to see the long standing local business thrive decided to invest in the company and became part owners. Those new owners consist of Lambert VanderMade (current President and CEO and a lifelong dairy farmer), David Reiser (current Chairman of the Board of Directors), Tina VanderMade, Brant Darnell and Tom Moriarty. Dennis Roehrig (a 33 year employee and current COO and VP of Production) is also a part owner. Arps Dairy’s leadership team consists of Dennis Roehrig, Adam Donaldson, and Nicholas Roehrig. Arps Dairy’s leadership team is responsible for bringing discipline and accountability into the organization, taking the vision down to the ground and making it real. The Arps Dairy leadership team has utilized the teachings of Gino Wickman through his book titled Traction to make this rewarding task possible.